As I don't have Korean class this week, I decided to go to Itaewon, which is kind of the foreigner area. I tried shopping for shoes with no luck (similar to at home), so I now know for sure that I either need to buy men's shoes or wait until I get home and can buy wide women's shoes. I also went and got acupuncture at a place by the station - I've been considering it for a while and I figured "why not?". It was really fun, only about $20 for the session and honestly for once my shoulder just feels okay and without pain during the day. Visiting again is only $15, so I'm definitely planning on doing that. Got a doughnut when I first got there to stave off hunger until dinner - I was planning on going to the "Nashville Cafe", something my dad's friend had told me about. The online reviews were really promising and it seemed fitting to get a whiskey and steak on Thirsty Thursday. Well, after literal hours of walking around shopping/trying to find the place, I was utterly stumped. I stood where the maps were telling me where it was, only to see a different "American" cafe. I must have looked really confused because a few American gentlemen in probably their late 50's approached me and asked if I was lost. I asked where the Nashville was, and they told me it closed down 2 years ago :( We talked for a bit, they recommended an Irish pub around the corner, and we went our separate ways. Usually I would follow the advice of someone who's been around the area for a while, but I had gotten it in my head I was having a big plate of meat for dinner, so I went to the American pub anyway. Honestly, it wasn't that good. 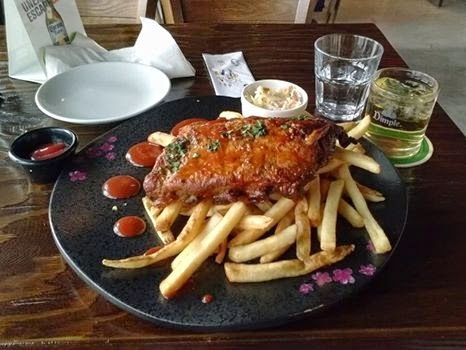 The ribs could have been great, but they put so much sauce on it that it covered up any other flavor, and the sauce wasn't that good. The fries and coleslaw were okay, and the whiskey was expensive. Never going back again, but it was nice to have my own Thirsty Thursday here in Korea.